Play as Jimmy Marvin, a young soldier, and try to defeat the evil Baron in a series of fun and challenging levels.Buy and customize planes by earning credits.Set your highscore in Survival Mode.To enjoy all the game's features, you must at least pass the first level. Avoid getting hit by enemy fire and planes. 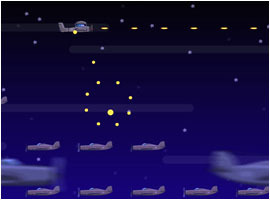 Bring down as much enemy planes you can to earn credits.